My Indirect Painting Instructional Video discs are in house and ready to ship! Nowell and I were thrilled to pick them up from the printer this morning. It’s been a huge project and we are thrilled to hold the final product in our hands. The video is 3 hours long, and is on DVD and Blu-ray all in one box. In it I share the entire process of creating my painting “Anchor in the Gale”. I also include all my handouts and materials lists on the disc. Quick tour of the students hard at work this morning on their cast drawings and paintings. Beginning students work with artificial light, advanced students create their cast drawings and paintings under natural north light. 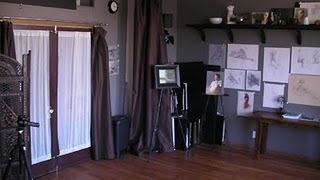 When students complete their cast work successfully they move on to live figure drawing and painting. 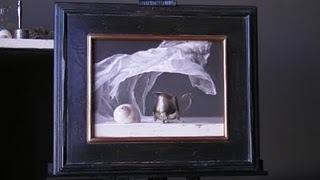 Sadie Valeri demonstrates layered, indirect oil painting in the tradition of the Dutch Masters of still life. I recorded many of my paintings and compressed these 40-80 hour paintings into time lapse videos only a few minutes long so you can see the whole process start to finish. These videos are free, but have no instruction or narration. Last month American Painting Video Magazine visited me in my San Francisco studio and interviewed me for their Summer issue, just released yesterday! You can hear an interview with me in my studio and also in-process footage of my newest painting, Undersea. Download Volume 2, Summer issue here! Walking through San Francisco’s historic North Beach neighborhood, I stopped to look at a shop window full of collectibles and curiosities, and caught sight of a large, barnacle-encrusted bottle. I went in and spoke to the shop owner, who said he he had dredged up the bottle from the bottom of the San Francisco Bay while diving. We struck a deal, I walked home with my treasure, and the next day the barnacle bottle was perched on my still life shelf, quietly demanding to be painted. Over the next few days an arrangement evolved which promised to consume my studio time for weeks: A collection of salvaged treasures seemingly dredged up from the bottom of the sea. In this painting I have grouped objects with a variety of edges and textures: The waxed paper nearly disappears as it melts into the shadows of the background, while the spiny contours of the crab claw strike a dramatic silhouette. The soft cool highlights of the glass bottle must compete with the warm, sharp whites of the barnacle shells. To capture this variety requires the most subtle decisions about color, value, and edge control. It takes many layers of thin oil paint to create the final result, as many as seven to ten layers in the most complicated areas. 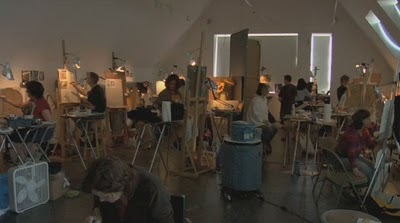 This is a recent clip of me teaching a drawing class in my studio. 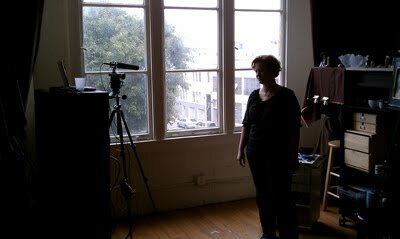 Yesterday I did my first Webcast studio tour and demo, this is me standing in front of the camera, ready for my close-up! UPDATE: Watch the Webcast again! The webcast was recorded, so you can still click here to register and watch the whole thing, including a drawing demo, a color-mixing demo, and lots of great questions and answers. The webcast went great and I really enjoyed myself. We had visitors from around the world, including as far away as Finland and Australia. The audience asked really good questions and kept me talking. I felt like I just skimmed over so many great topics, so I'm hoping to do a whole day-long workshop webcast in the future. 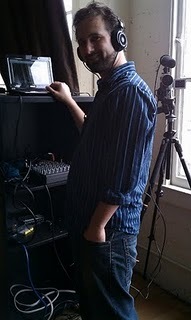 Here is my handsome camera guy, my husband Nowell, who turned a corner of my studio into a professional broadcasting suite for the day, complete with mixing board and a backup boom mic mounted on the camera, just in case my fancy rented wireless lapel mic didn't work (it worked great, though!). 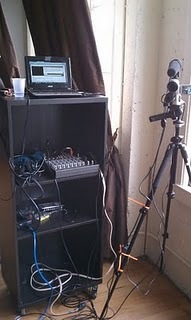 A closer look at the sound and video setup. We had a brief moment of freeze-screen, but other than that we sailed through without any major technical hiccups. Phew! My studio looked so spiffy I had to take some photos. 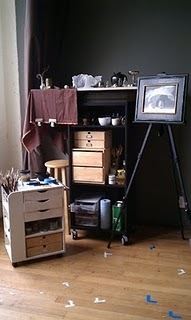 Above is my little still life painting corner where I spend most my time. Webcast viewers got a look at my most recent painting which will be shipped to Arcadia Gallery in New York for the Sept 23 Small Works show. We talked about what paints, panels, and brushes I use, and I did a little demo showing how I mix up cool and warm strings of neutral colors on my palette. 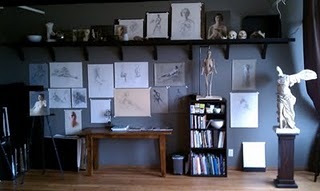 My still life shelf is at the left, my model stand is in the middle. To the right I have screens arranged as a changing room for my models. Lady Victoire is looking happy. 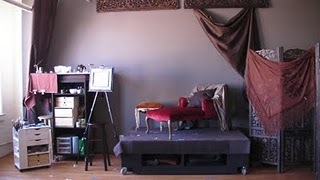 The studio doors and a couple recent paintings on easels. Thanks everyone who was able to register and attend, it was a huge success and I look forward to doing it again! I made this 8 minute movie of my 10-hour drawing of my cast statue "Victoire de Samothrace" to demonstrate the optical block-in method. 1. The line drawing is all straight lines. 2. The shadow side is first filled in as all one even tone. These two methods are difficult to adhere too, but if you can do it they address the main difficulties in drawing: capturing accurate proportion, and understanding light and shadow. 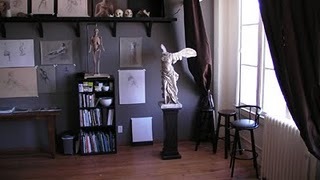 I'll be teaching two workshops on still life painting in summer 2010, one here in the San Francisco Bay Area and one in Florida. Details to follow soon! Draw a straight-line block-in of your composition with pencil on white drawing paper. Make your drawing the same size and shape as your painting panel. When your block-in drawing is done, lay it down on a table (not an easel) and overlay a sheet of tracing paper. Tape down all 4 corners with removable artist's tape. Trace your drawing onto the tracing paper with a hard pencil (H or HB). Be sure to trace the corners of the drawing too, so you can line it up correctly on your panel. Remove the tape, flip over your trace paper drawing and scribble gently with a soft pencil (2B/3B) over all the lines you can see through the trace (OR you can use transfer paper, which you can buy in rolls at the art supply store). Arrange the trace paper drawing-side up (scribble side down) over your panel. Line up corners with the drawing. Tape all the corners. Using a hard pencil (2H) go over all lines of the drawing to press the contour lines onto the panel. Occasionally lift one corner to make sure the lines are transferring. I made a video slide show showing all the stages of the painting and some detail closeups. You can see the movie for this painting here. 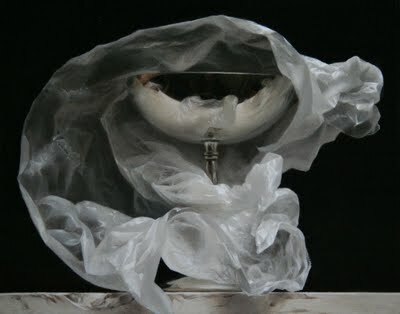 In 2008 I began a series of still life paintings using crumpled wax paper as my subject. I was drawn to the material because I can twist, and crush the wax paper into draped and spiraling shapes to create dynamic environments for the simple, antique bottles and pitchers I collect. I am always on the lookout for interesting vessels to paint, and when I found a spherical silver water pitcher at a flea market, I instantly fell in love. Certain objects call to me and must be painted. I have learned that collecting something not-quite-right, just because I "might use it someday" is rarely successful. Those objects languish on my shelf for years, always passed over. The objects I paint resonate with me deeply and demand to be painted immediately. 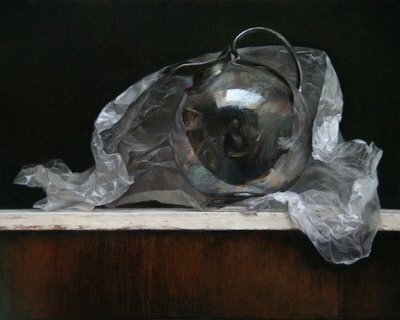 I had a vision of the silver globe pitcher draped in a "shawl" of crumpled wax paper, with the shawl arranged as if a small breeze were filling and lifting it. When I set up a new still life I spend several studio days crumpling paper and discarding it, moving objects around, trying to find the best shape and composition through my viewfinder. The wax paper takes gentle coaxing and twisting to arrange it in with the feeling I am envisioning. The final arrangement must look fresh and transparent, like it just landed there, no matter how many discarded pieces it took to reach my vision. I begin all my paintings with a detailed contour drawing in graphite pencil on wooden panel I have prepared myself with homemade gesso. I spend several days on the drawing, first on trace paper and then directly on the board. I find that if I spend the time needed on the drawing, the structure and believability of the final painting is more successful. I never rush the drawing process, even when I am anxious to begin painting. Once the drawing is finished, I paint in many layers over the course of a month or more, first in grays, called a "grisaille", to establish values, and later in color. I use tiny brushes from start to finish, and work on a small area each day. I move slowly around the painting, bringing each section up to the highest degree of finish possible before moving to the next area. Silver Globe Pitcher took me over 120 hours to complete over the course of 2 months. It is only the latest stages of my process where I get to enjoy the beautiful and most subtle effects of light and texture on the surface of the objects, like the turquoise tarnished area at the base of the pitcher, the transparent paper melting into the background, the pedestal of the pitcher peeking through the folds of paper. But it requires all the earlier stages of building a solid drawing and value structure in order to successfully render the beauty I see in the surface details. Silver Globe Pitcher is a rare instance where I include a self-portrait in my painting. I wanted the self-portrait to be a discovery, so the viewer sees and appreciates the whole composition first, before noticing my tiny image reflected in the vase. That way, each viewer has a sense of having discovered something on their own, a small secret in the painting. My self-portrait embedded in the painting allows each person to discover my own image peering back. The viewer can see the entire little studio where I worked on this painting, and have a sense of being able to get a glimpse into the experience of the painter. See the previous blog post about this painting here. This movie is hosted on YouTube, which greatly degrades the quality. Click here to see a better quality version of the video demo. This is so cool - Nowell set up his high-definition digital video camera on his tripod and recorded a couple time-lapse films of our art class this week.